Located in the heartland community of Cedar Rapids, Iowa, J-TEC has been providing vortex flow meters and sensors for automotive, military, industrial and mining applications since 1968. J-TEC’s first development efforts resulted in a technique for measuring ocean currents and an anemometer for the National Data Buoy Program to aid in weather forecasting. This invention of a unique and proprietary technology has formed the basis of the principal products of the company and led J-TEC into various flow measurement markets. 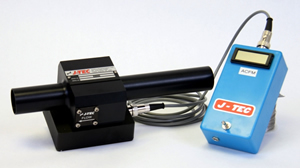 J-TEC developed and perfected the detection of vortex shedding through ultrasonic sensing in 1968. An ultrasonic beam, located downstream from a small strut, is transmitted through the vortex pattern. As the vortices travel through the beam, they modulate its carrier wave. This signal is processed electronically, providing a very accurate reading of the flow rate. Because the number of vortices formed is directly proportional to the rate of flow, this technology provides a highly accurate and extremely useful method to determine flow in a wide range of applications. Founders: Theodore Johnson and Robert Joy. Using this technology, J-TEC provides a variety of flow meters for your internal combustion engine testing and other requirements.